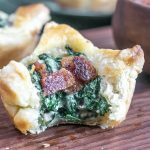 These easy Spinach Puff Pastries appetizers are a delicious golden puff pastry filled with cheesy creamed spinach, and plenty of bacon. It's an easy appetizer recipe for your holiday party! Note: You will have extra creamed spinach. Store it in the fridge for dinner later in the week or freeze for up to 2 months.